DISCLAIMER – nothing that you will hear in London purveyors of swirling guitar ephemera Ulrika Spacek’s new album will be new to you. In fact, you probably will have heard many varying shades of the iridescent clamour that mirrors the ten tracks burning opaquely on Modern English Decoration elsewhere. But there is an inherent sun-down haze that permeates these tracks, complemented by the Victorian-era locale in which the album was recorded, that makes this an album that is difficult to shake, the skin-deep ethereal warmth seeping deeper, taking root, refusing to let go. The five-piece haven’t wasted time between records, releasing Modern English Decoration a year after impressive opening gambit The Album Paranoia. But while their second recorded effort may not include the more serrated lashings that fleshed out its predecessor, these songs, having been forged in the fire of insecurity and adolescent abandon, have come out fully-formed, their wistful distorted wall of noise skillfully hiding a crystalline precision, their lackadaisical demeanour belying prodigal integrity. Take the opening tracks, ‘Mimi Pretend’ and ‘Silvertonic’, for example. The way the guitars intertwine here is heavily reminiscent of either Television’s knack for lithe propulsion and melodic efficacy or Canadian band Women’s panache for measured nonchalance underscored by an untapped, surreptitious menace (sometimes both). The quieter breaks of the former song where lead Rhys Edwards breathily says “I can stay a little while” before a warbled cacophony of feedback is underpinned by a chugging rhythm, and the elongated motorik outro to the latter, smacks of Deerhunter and all its affiliate offshoots. These are likely to be oft-repeated comparisons, but they nevertheless are ones that echo expansively across the album. Depending on where you stand, the album is incredibly consistent or consistently one-note – while each song has its own inherent DNA, and stand on their own, together it becomes a wash of motorik rhythms and distorted undulations that moves over you, a nebulous golden cloud. The one-two louche psychedelic punch of ‘Ziggy’ and ‘Everything, All The Time’ is augmented by the narcoleptic hush of Edwards’ warbled vocals, distorted enough to barely make out the syllables even at ebullient pitch. The slowed, ghosted, drunken, wah’ed out whimsy of the title track stands out due to its discretion – a harmonized dream in an iron lung – yet there is still a jagged jangled heartbeat within the wasted chagrin here that electrifies. The imperfections of the record add to the charm – the dead air at the beginning of ‘Silvertonic’ picks up the distant peal of a police siren, a wry touch of real-world aestheticism in what is effectively an album of otherworldly “otherness”; the slow swirling hiss and warble opening and closing ‘Saw A Habit Forming’; a slightly flubbed tom at the beginning of ‘Ziggy.’ It all embodies a DIY charm that further entrances, somehow at odds yet embracing the tightness that pervades this effort. It’s how the five members weave in and out of each other’s liminal spaces that imperceptibly makes these songs impossible to ignore. The frenetic guitar interplay between Edwards, Rhys Williams and Joseph Stone either creates a golden mist of psychedelic wash or a double-time metronome, meticulous maneuvers that hypnotize and enthrall. Ben White’s bass is especially seductive, often slinking in thirty seconds into a song, transforming an already active skeleton into a flowing beast. Callum Brown is ramshackle behind the kit, either shambling, marching or stop-motion lurching at the heels of the swirl. 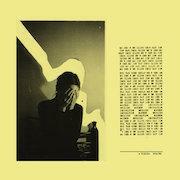 It can go from cosmic eddies and low-form concussions to economic post-punk (closer ‘Protestant Work Slump’ especially ringing out the Women understated unease bell) yet retains its own world dimensions. Everything comes fully formed and in its right place. Modern English Decoration is an album that is made to listen to from start to finish, the sepia wash a constant inebriation where the slightest ripples, ebbs and flows offer the minute variations that hook you in and hold you under. There is nothing new here, nothing especially innovative either. It’s just an album that consistently hits its target in a magnetic, mesmerizing way, and one that if you let it will swallow you whole.